As has been shared by Gamespot, Sega associate brand manager Ken Balough has revealed that Project Needlemouse, a title first teased during the Dreamcast's 10th anniversary last September, will be a direct sequel to the Sega Genesis Sonic the Hedgehog titles. Named Sonic the Hedgehog 4, the title brings back Sega's mascot to 2D, and will feature classic Sonic elements like the spin dash. While it was heavily rumored that the project would be an Xbox 360/PlayStation 3 exclusive it has been confirmed that the title will also be hitting the Wii. "One of our goals was to make a gorgeous-looking 2D Sonic game. This approach allows fans new and old to see what a 2D Genesis-style game would look like today with modern graphics," said Balough. While the gameplay is restricted to the 2D plane, the graphics will be rendered in 3D. 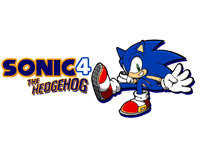 The game will be released in episodic installments starting with Sonic the Hedgehog 4 Episode 1. Finally, the game will incorporate motion controls in select areas, run in 480p, and feature leaderboards so that players can compare their best level completion times. Sonic the Hedgehog 4 Episode 1 will be available on WiiWare this summer. Nintendo World Report has contributed to the report.